Comments: Mild to moderate shelf/reading wear. Binding good. HAS UNDERLINING, HIGHLIGHTING, AND/OR MARGIN NOTES THROUGHOUT; TEXT IS UNAFFECTED. Orphans Treasure Box sells books to raise money for orphans and vulnerable kids. The First Night Something was wrong. My husband, Joe, had left my hospital room only a few minutes before, but already a foreboding feeling was enveloping me. I would be alone through the night, alone on the eve of one of my most frightening challenges. Thoughts of death began creeping into my mind. Thoughts like these had not come to me in years. Why were they so pervasive now? It was the evening of November 18, 1973. I had entered the hospital to undergo a partial hysterectomy. As a thirty-one-year-old mother of seven who was in otherwise excellent health, I had chosen to follow my doctor's advice to have the operation. Both my husband, Joe, and I felt comfortable with the decision. I still felt comfortable with the decision, but something else was bothering me now--something unidentifiable. In our years of marriage we had rarely spent nights apart, and I tried to reflect on our family and the special closeness we enjoyed. Although we had six children at home (one had died of Sudden Infant Death Syndrome when she was an infant), we were sometimes reluctant to leave them. Even on our "date nights" we would stay home and let the children plan our dates for us. Sometimes they catered a dinner for us, providing candlelight in the living room with a fire crackling in the fireplace. We usually had just the right music too--maybe not the music we would have chosen but perfect nonetheless. I recalled the evening they served us Chinese food on a decorated coffee table and provided large pillows for us to sit on. They turned the lights down low, kissed us good night, and giggled as they hurried up the stairs. Joe and I seemed to have found a little bit of heaven on earth. I reflected on how lucky I was to have a companion as loving and considerate as Joe. He had taken vacation from work to be with me before I went into the hospital, and he planned to spend another week at home while I recuperated. He and our two oldest daughters, who were fifteen and fourteen, were already making plans for a wonderful Thanksgiving dinner. The feelings of foreboding settled more heavily upon me. Perhaps it was the darkness of the room, the terrible darkness I had learned to dread as a girl. Or maybe these ominous feelings came from another experience, an experience in a hospital years ago that still filled me with questions--and wonder. * * * When I was four years old, my parents had just separated. My father used to say that "marrying an Indian woman back in those days was probably the worse thing a white man could do." He was a fair-haired Scotch-Irishman, and she was a full-blooded Sioux Indian. As the seventh of ten children, I hardly had a chance to know either parent before they separated. My mother went back to live on the reservation, and my father went to live with his parents in town. At that time, six of us children were placed in a Catholic boarding school. It was while at the boarding school that first winter that I developed a terrible cough and began shivering constantly. Forty girls shared one large room, and I remember leaving my bed one night and getting into my sister Joyce's bed. We lay together and cried--I in my fever and she in fear for me. When one of the Sisters came by on her nightly rounds, she discovered me and took me back to my bed, which was damp and cold with perspiration. Joyce tried to convince the Sister of my illness but was unsuccessful. Finally on the third night I was taken to a hospital. The doctor diagnosed me with whooping cough and double pneumonia, and he told a nurse to contact my parents. I remember his telling her that he didn't expect me to live through the night. As I lay on the bed, burning with fever, I seemed to slip in and out of sleep. Once, I felt hands on my head and, looking up, I saw a nurse leaning over me. She ran her hands through my hair and said, "She's just a baby." 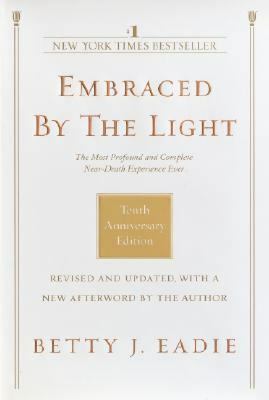 I'll never forget the kinEadie, Betty J. is the author of 'Embraced by the Light' with ISBN 9780553382150 and ISBN 0553382152. Loading marketplace prices 606 copies from $3.09 How does the rental process work?